If you are planning on hitting the slopes to go snowshoeing, few things are more important than snowshoes, obviously. By distributing the entire weight of a human being across a larger surface, snowshoes help to keep your foot from plummeting deep into the snow-pack. Traditionally, snowshoes were made from wood and rawhide, but today many snowshoes are fashioned using lightweight metals, synthetic fabrics and plastic. Snowshoeing can be simple and fun, given the right area and set of shoes. Today, we will be reviewing one of many pairs of Red Feather snow shoes. The Red Feather La Crosse Pilot II Technical Snowshoes are state-of-the-art snowshoe genius. Red Feather was founded in 1988 and instantly began revolutionizing the way the modern snowshoe was viewed. Designed for use in deeper snow, the La Crosse Pilot II significantly aids in flotation and angled ascents/descents and helps people to walk naturally, reducing fatigue when engaging in long snowshoe excursions. Composed of stainless steel, aluminum and injection-molded plastic, these snowshoes will provide abundant assistance in all of your winter treks. As with many Red Feather snow shoes, the La Crosse Pilot II has a free-sliding heel plate that fits to any user’s boot size, which in itself makes this a worthy product. The interchangeable crampon system is absolutely fantastic, of which Red Feather is a pioneer by being the first company to offer this (along with interchangeable bindings) on all its products. The pivot rod hinge keeps your heel stable which allows the tail of the snowshoe to drag in the snow, adding to the flotation effect and also helps keep the tips upward for when in deeper snow. With three different models depending on your body weight, you can be sure to select the appropriate shoe for your weight and trek. After evaluation, there really were no negative aspects to be found on this snowshoe. This is a Class A product from Red Feather and we would recommend it to anyone looking for a new set of technical Red Feather snow shoes. The Red Feather La Crosse Pilot II Technical Snowshoes are simply awesome. 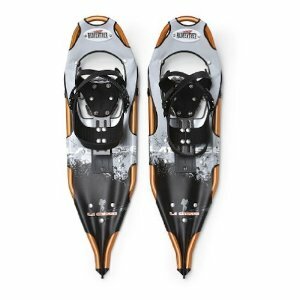 With excellent flotation, navigation, comfort-ability and functionality, there really is not a reason to look elsewhere for an alternative snowshoe. Red Feather’s philosophy is simple: to keep their commitment to total customer satisfaction and innovation by making sure constant advances are made in both of these areas. Red Feather has upheld the ideas of its philosophy in this shoe and we are sure that they will continue to provide the best professional competence, the best products and do so with integrity and at a competitive price. This entry was posted in Other, Reviews, Snowshoes, Spikes and Crampons and tagged Red Feather, Snow Shoes. Bookmark the permalink.